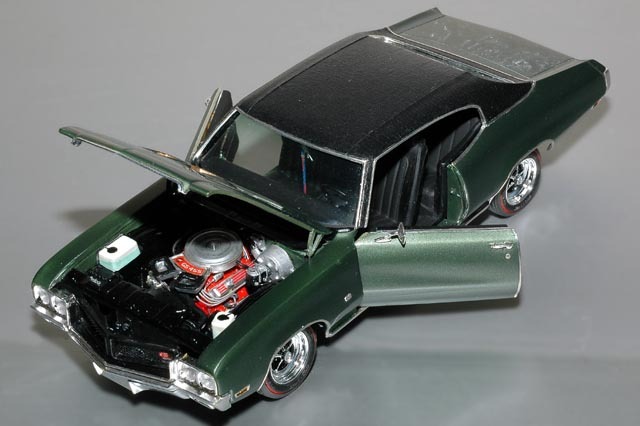 Starting with a Revell-Monogram 1970 Buick GSX kit, Dave opened and hinged the doors, which required a significant amount of modification to provide sound structural support at the base of the A-Pillars. He next opened the hood scoops allowing them them to authentically pass air to the Ram Air intake system lurking below. Dave cut open the grille and filled it with photoetched mesh. He made all the "GS" emblems by burnishing aluminum foil over the kit's original GSX grille emblem, filling with epoxy, and cutting away the "X".